Antique CAMEO ROSE Metal Casket Click on image for a larger photo. CALL US AT 1-800-550-7262 for answers to any questions! completely tailored over an adjustable bed. sweeping corner rays. Feminine, beautiful & tasteful! Athena Briar Rose Metal Casket Click on the image for a larger photo. CALL US RIGHT NOW FOR ANSWERS TO YOUR QUESTIONS! feminine look along with unique shading unlike any other. must have Overnight, call us for quote if you desire this. Blue & White Spray Rose Steel Casket EXCELLENT - MADE IN AMERICA - SELECTION! questions any part of your funeral arrangements! selection. 18 gauge steel is used and made in the USA. Unique CUSTOM designed casket UNAVAILABLE from any other source! Roses that are embroidered along with a Pipe design. it is available for an additional charge. Call us for a quote. Brushed Platinum Veteran Tribute Steel Casket Click on the image for a larger photo. shown in the head panel with flag emblems on each side. If you need overnight or rush delivery call for quote. Cameo Rose Custom Designed Steel Casket EXCELLENT - MADE IN AMERICA-SELECTION IS EXCLUSIVE! unique Veiled Rose displayed with 4 sweeping corner rays. Chinese model and lose this specially priced American product! pinstripe, these 18 gauge steel caskets are made in the USA. inner bed for proper fitting. The casket has a gasket & lock. if you wish, instead of the Chapel Cross. it is available for an additional charge. Call for a quote! Copper Phoenix American Steel Casket Click on the Image for a larger Photo! 7262 for answers to your questions. 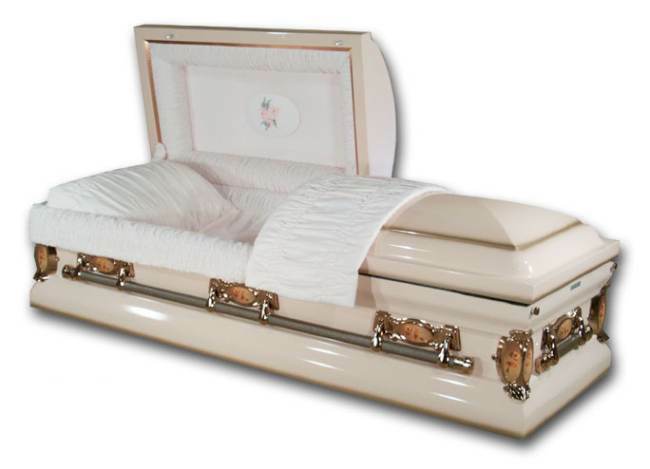 provides for proper open casket viewing if desired. Tan frost crepe is the interior with a T panel design. Do not pay more for less. Crown Star American Steel Casket Click on the Image for a larger Photo! it is available for an additional charge. Farmer Green Tractor Steel Casket Click on the Image for a larger Photo! SPECIAL PRICING IS AVAILABLE NOW! DO NOT HESITATE! made with a gasket all around. end and sides have a Country Farm Scene. hands on the farm and contributed to what has made America great! The Salt of the Earth! charge. Call us now for a quote if a rush is needed. displays the honor he is due! is available for an additional charge. Going Home Sky Blue Metal Casket Click on the image for a larger photo. Heavenly Devotion - Lords Prayer Casket Click on the Image for a larger Photo! 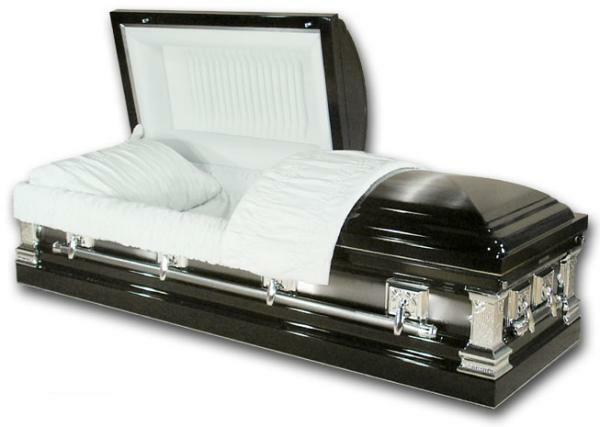 casket is MADE IN THE USA keeping Americans working! Prayer within an Open Bible. White Frost Crepe interior, blanket and pillow. for a quote if you are in need of a quicker delivery. Hunter Green with Gold Mirrors Casket Click on the image for a larger Photo! IN THE USA and is keeping Americans working! a special touch to the rich green finish and Gold pin striping. and if you need overnight and/or rush delivery, call for quotes. In Gods Loving Care Blue Steel Casket Click on the image for a larger photo. Proudly made with top quality craftsmanship! solid gold with black handles. available for an additional charge.Ask for a quote. Lilac Duchess Metal Casket Click on the image for a larger photo. with the Head Panel tailored with a simple piped design. Lincoln Black Cherry Steel Casket Click on the image for a larger Photo! the USA!Truly a Presidential selection. cherry and plum highlights for an exquisite finish. Velvet interior with a beautiful fan pipe panel. just beautiful, but allow easy carrying for the pall bearers. Misty Pink Bouquet Steel Casket Click on the Image for a larger Photo! along with full swing bar handles. panel is a custom Pearl Rose design in the center. price without compare from any funeral home. available - call us for a quote. Mothers Pink Love Steel Casket CALL US RIGHT NOW FOR ANSWERS TO YOUR QUESTIONS! panel with tasteful drapes on sides. Open Bible - Praying Hands - Calvary Crosses Metal Casket Click on the image for a larger photo. AVAILABLE AND WE DO NOT WANT YOU TO LOSE IT. steel casket is sturdy and strong. is tailored over a fully adjustable inner bed for proper fitting. The casket has a gasket & lock. one who was devout and faithful to their beliefs. Purple Haze Gold Mirror Casket Click on the Image for a larger Photo! CUSTOM made - unavailable from any other source! The interior is quality White Crepe with a custom Sunrise panel. If desired, another fashion designed panel can be placed instead. gasket and lock system. Unique and available only from us. it is available for an additional fee. Call for a quote. Remington - Ebony Silver Steel Casket Click on the image for a larger photo. Traditional Praying Hands Blue & Silver Casket Click on the image for a larger photo. Wedding Rings Quilt Steel Casket Click on the Image for a larger Photo!